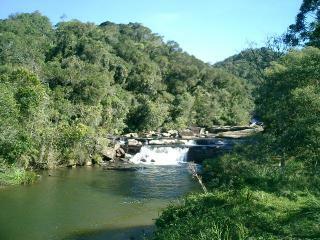 The Atlantic Forest South-East Reserves comprise 25 protected areas of Atlantic forest in the southeast region of Brazil. Atlantic forest is the richest rainforest in terms of biodiversity. It has high endemism and a large number of tree species. Rare and threatened animals include the woolly spider monkey, Southern muriqui, Southern Brown Howling monkey, four species of tamarin, the ocelot, Jacutinga, Harpy eagle and the Brazilian red-tailed parrot. Just visited a part of rainforest (March 2013). As the site consist of several reserves, National Parks or ecological stations and mostly due to bad weather I decided to stick to one location to have an overall view of the area. Because of communication issues I go to Peruibe (4 hours by bus from Sao Paulo - Terminal Rodoviário de Jabaquara, there are several buses daily) as the starting place for Jureia-Itatins Ecological Station, in fact a huge reserve, located just close to Peruibe town. If you cross the river you are already in the Jureia Park. The most beautiful place and highly recommended is called Cachoeira do Paraíso and is located some 25 km from Peruibe (there are some buses daily to get there at least in theory, because due to weather conditions the bus may occasionally not operate - it is better to check on Peruibe bus station a day before) or you can walk - on the asphalt road it is possible to hitch-hike. It is written everywhere that there are only certain amount of people entitled to go to Cachoeira do Paraíso but I did not encounter any troubles to go there - it is also not necessary to have licensed guide to go there as the path is well marked. This is one of the largest, and most fragmented WHS I have ever visited. It consists of about 25 protected areas, National Parks, State Parks, Ecological Stations, wildlife Zones etc. Some do not allow casual public access while others see large numbers of visitors, mostly, unsurprisingly, Brazilians. In January 2009 I came off an overnight flight from London at Sao Paulo, took the city bus to Barra Funda bus station and from there a coach to Cananeia. The site comprises of the Serra do Mar coastal mountain chain (with a maximum height of about 1400m), the coastal plain, the coastline itself and a number of offshore islands. I had about 4 days in which to explore this huge and diverse area. I could find no way, using public transport, that would allow me to see both the karstic uplands and the coast so I decided to limit myself to just the coastal areas. Cananeia is a small, characterful sea side town from where I made the brief ferry crossing to Ilha Comprida. My exploration of this large island were severely limited by the lack of public transport. Throughout the 4 days the weather was never good, with a lot of heavy rain and low cloud so that next day a planned trip to Ilha do Cardoso had to be aborted. I retreated to Curitiba, looking, unsuccessfully, for drier weather inland and the following day took "the best train ride in Brazil" to Morettes. It may well be but I'm afraid that once again bad weather made it impossible to tell. From Paranagua, an attractively decaying port in the rain, I took the ferry down the mighty river estuary to Ilha do Mel. This was a pleasantly relaxed place with gentle waves lapping almost on the steps of the Youth Hostel on the western side of the island while only a few hundred metres walk across the isthmus which joins the two parts of the island mighty Atlantic breakers were crashing onto the shore. In the whole of the area that I saw, where man has not cut down the trees, vast dark green wet forests stretch over the hills into the distance. I would welcome the chance to go back to this area in better weather and explore some more, particularly in the limestone hills and caverns inland. Includes former TWHS Estuarine Lagoon complex of Iguape-Cananéia-Paranaguá (Lagamar Complex) (1999) and "Paranapiacaba - Upper Ribeira"
Qhapaq Nan (Inca): The Peabiru Trail passes through the reserve. It was not an integral part of the Qhapaq Nan but was used by the Inca. Natural sites with indigenous human population: About 200 people live in the core zone most of whom are Guarani. Derived from more than one TWHS: "Lagoon complex of Iguape" and "Paranapiacaba - Upper Ribeira"